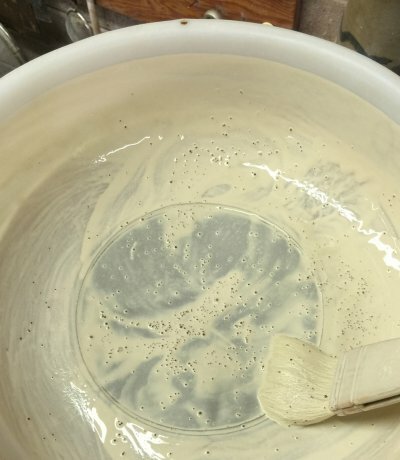 If a glaze slurry contains soluble or partially soluble raw materials or is made using hard water, then solids can precipitate over time forming hard lumps, crystals or a scum. At a minimum the solubility of many materials is enough to stain the water in a slurry (seen on the top after the powder has settled). It seems logical that ceramic powdered materials, being ground up rock or glass (in the case of frits) would not be soluble. But this is not the case. Solubility is often a matter of chemistry. Certain frit chemistries, for example, are much more vulnerable to dissolution. This is because frits often need to push the boundaries of stability (therefore solubility) to deliver the desired chemistry (e.g. those lacking alumina). Frit production is not always precise, variations can lead to instability. Stains are also subject to solubility (for this reason some are acid washed). Solubility of materials is often a simple product of increased surface area. For example, the solubility of feldspar or nepheline syenite rock is very low, but when ground into a powder its surface area is multiplied thousands or millions of times. This is enough to create noticeable solubility. 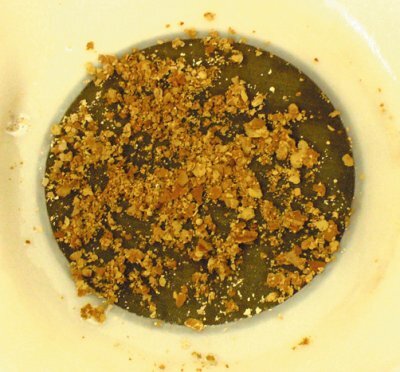 Other materials are known to be contaminated by soluble salts. Gerstley borate, for example, gels glaze slurries, so obviously it is releasing ions into the suspension (its constituent minerals are also less stable than most other common ceramic materials). 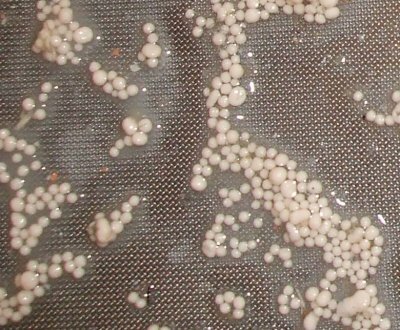 Ball clays likewise release scum as they dry (solubles are sourced from contaminants that get ground up with the clay itself, these are carried to the surface and precipitate there as brown scum as the water evaporates away). 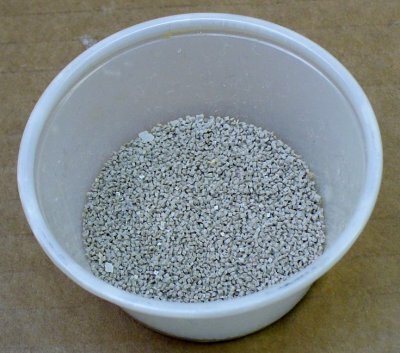 Manufactured materials like barium carbonate and lithium carbonate are partially soluble (this is just what they are). Precipitation is not just a product of over saturation that occurs over time. It can also be a product of the interaction of various ions to be found in solution (which may well want to interact). Often it may appear that a particular material is guilty of precipitating in a specific glaze, however that same material may appear in another recipe where no precipitation occurs. You can minimize precipitation and solubility in glazes by storing them in a cool place. And by making smaller batches and cycling them more often. 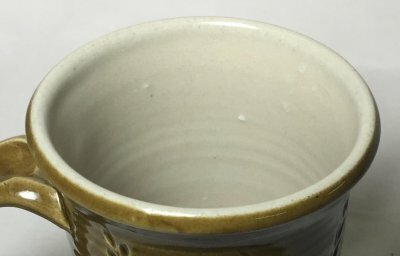 Solubility of stains can affect the fired product (producing cloudiness on the surface of fired ware). In such cases it may be necessary to wash your stains before use (in vinegar for example). Soluble ingredients in glazes always precipitate as angular crystals. Right? Wrong. 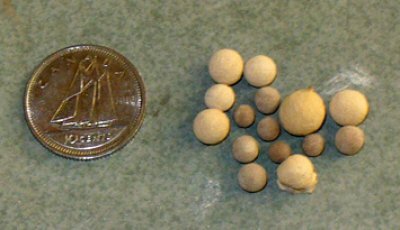 These tiny spheres (actually they are not so tiny) form over time as a precipitate in a glaze having a high concentration of a boron frit and mixed in hard water. This may be an example of how interactions can affect the degree to which materials dissolve in water (in this case the electrolyte in the water could be a trigger). These are likely ooids. These flakes have been screened from a highly-fritted boron glaze mixed using hard water and stored for a year. They formed as a film across the top of the settled surface and on the walls of the bucket. Frits are stoichiometric, they should not dissollve, but they do. Perhaps this is evidence that frit makers are unable to precisely control production parameters. Are frits partially soluble? Yes, many are. These 1 mm-sized crystals were found precipitated in a couple of gallons of glaze containing 85% Ferro Frit 3195. They are cubical, hard and insoluble. Why and how to do they form? Many frits are slightly partially soluble and the degree to which they are are related to the length of time the glaze is in storage, the temperature, the electrolytes and solubles in the water and interactions with other material particles present. The solute then interacts with other materials particles to form insoluble species that crystallize and precipitate out as you see here. These crystals can be a wide range of shapes and sizes and come from leaded and unleaded frits. Add 5% calcium carbonate to a tenmoku. What happens? 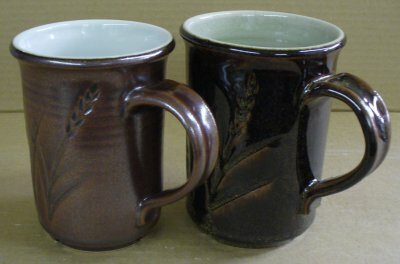 In the glaze on the left (90% Ravenscrag Slip and 10% iron oxide) the iron is saturating the melt crystallizing out during cooling. GR10-K1, on the right, is the same glaze but with 5% added calcium carbonate. This addition is enough to keep most of the iron in solution through cooling, so it contributes to the super-gloss deep tenmoku effect instead of precipitating out. It also contains less than 10% borax frit and some Cornwall stone.